Some people join the military and get out as soon as they are allowed. Other, more dedicated sorts spend their lives in accordance to its core principles. Bruce Coleman never had much. He dropped out of high school. After a stint in the Marines, he spent a period dining from dumpsters in the City of Angels. The military was the only reliable thing in his life, so he dedicated his life to it. 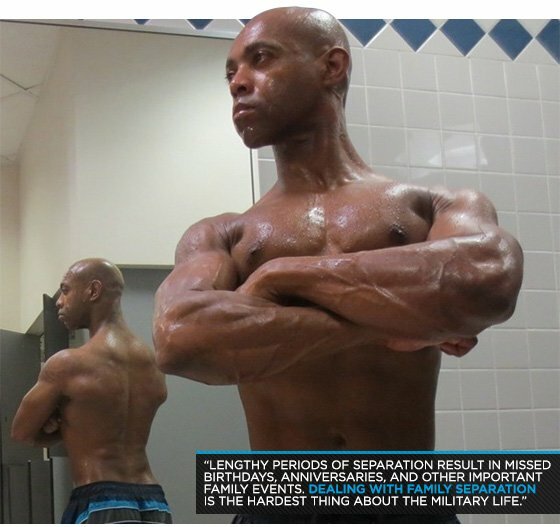 Now that it's over, and he is a retired master sergeant, he has let bodybuilding guide his future. He competes, trains and now shares his story of discipline in the corps and his career in the army. Structure is the easy part; constructing the capacity to follow your own orders—that's where things get difficult. I've been training my entire adult life, but I was never consistent with my weight training until I was 44 years old. I started competitive bodybuilding at the age of 48. I did a total of seven competitions between March and November of 2012. There is nothing like getting up on stage wearing next to nothing to get you to step up your game and be the best you can be. Take a look at my progress pictures on BodySpace and you will see that I've made more progress in the past year than in the previous four years altogether. If you want to get better, start competing. My civilian to military transition was more than 30 years ago. I was a 17-year-old high school dropout and convinced my parents to sign the age wavier so I could enlist. I had come across a recruiting brochure entitled Life in the Marine Corps and I wanted what it promised. I still remember this promise verbatim: "Marine Corps Boot Camp is no picnic. It's getting your mind and body into shape like it has never been before, instilling an unbeatable spirit of 'can-do.'" I remember sitting in the reception station at the Marines Corps Recruit Depot on Parris Island, South Carolina. This was before we met our drill instructors or got our new haircuts and uniforms. In walks this bald-headed recruit in uniform. He starts crawling around the floor and underneath a table crying: "Keep him away from me, keep him away from me!" I remember asking myself "What in the world did I just get myself into?" From my military experience, I learned the need to control your thoughts when things get tough, so you are able to maintain the belief that you can do it. The Corps was true to its promise. The transition from a lifetime spent in the military to civilian life was harder for me. I never gave life after the military much thought until I had my retirement paperwork in hand. I tell all my brothers and sisters who are career military to realize that all of us have to pull the uniform off for good eventually. Don't wait for that day to become a 50-meter target before you prepare to meet it. Plan and control your thoughts to maintain the positive expectation that this too you can do. If you start planning for it five years out from retirement it will bring excitement, not anxiety. Ready or not, that day will come. It is your choice how you will meet it. Combat Arms, there was nothing else in the military I wanted to do. As a combat solider, fitness is the foundation for all your weapon systems. You can't put rounds on target if you are too tired to get into position, or too weak to send it. It was either the military or an action movie star. I tried the movie star thing after my first enlistment. I moved to L.A., but it didn't take long before I was broke, living in my car, and eating out of garbage cans. The whole six-month break in service taught me the personal value of the military 7 Ps: "Proper Prior Planning Prevents Piss Poor Performance." I've spent most of my military career in Special Operations. High levels of fitness are common to Special Operations forces like Rangers, Special Forces, and SEALs. Just before retiring, I was assigned to a joint unit with members of all types of occupational specialties from across all the services. Standing in back of the morning formation before PT, I could tell just by looking at the physiques which service member was in what service. Generally speaking, the Marines stood out as looking and being the fittest. To perform your sworn duty requires a lot of sacrifice, not just for the military member, but from their family as well. Lengthy periods of separation result in missed birthdays, anniversaries, and other important family events; it can be difficult for all. Most civilians have no clue. Dealing with family separation is the hardest thing about the military life. PT test scores were important for promotions and school assignments. The military teaches you from the start to do what needs to be done. This habit transfers to all parts of life. Fitness is one of those things that need to be done. I would say it is less difficult. Being physically fit is a part of the military job description. Other than professional athletes, not many other civilians have any such fitness requirement. Because it is a requirement, time and resources are made available for fitness in the military. For the most part, civilians are left totally on their own. Rangers lead the way. This is to say, I have been trained to lead by example. If you are in a leadership role and you expect your subordinates to be in shape, then you had better be in shape too. I do the same three-part warm-up six days per week. The whole sequence takes me about 25-30 minutes. My approach to diet was to try everything out there until I found something that worked for me. If the standard "eat super clean 6-7 small meals a day" is working for you, then by all means stick with it. If like me, you find the standard diet rules are not working as well as you would like, get rid of them and try something new. It took me years to get to the point where I realized that what everyone else said works wasn't working well for me. About a year ago I tried intermittent fasting and I haven't once considered going back to eating 6-7 times per day. The thought of eating that often sounds as crazy to me as eating only one meal each day sounded to me before I tried intermittent fasting. This is my current pre-contest diet. My post-workout meal consists of whey protein and pure honey. My one solid meal of the day is eaten around 5 p.m. I break my fast by eating one apple and 1-2 bananas. Then my main course consists of a protein (usually beef or chicken) and a starchy carb (sweet potato, rice, macaroni salad). I finish that with FiberOne Brownies and dark chocolate (72 percent cacao). The only thing I drink is water, black coffee, and unsweetened green tea. I eat like this six days per week. The only thing that varies is the protein and carb for the evening meal. I will also throw in a bag of microwave popcorn from time to time. I measure nothing but powdered supplements, I don't count anything, and I don't stress about my diet at all. Sunday is my rest day from both my training and my diet. I eat breakfast around 8 a.m. It consists of a salad (spinach, grape tomato, raw broccoli, cauliflower, and carrot). I use Newman's Own Olive Oil and Vinegar dressing. I will also have 3-4 Baby Bell pieces of cheese, and as may raw unsalted almonds as I want. I eat lunch somewhere around noon. All I look for is a protein and starchy carb. I eat Sunday dinner with protein, starchy carb, and any vegetable my wife prepares. It is not scientific, exact, or traditional, but it is simple, stress free, and works for me. Meal 2: Dinner 4-6 p.m. I am currently striving to become an IFBB Men's Physique Pro. My ultimate bodybuilding goal is to win the BodySpace Spokesmodel competition. 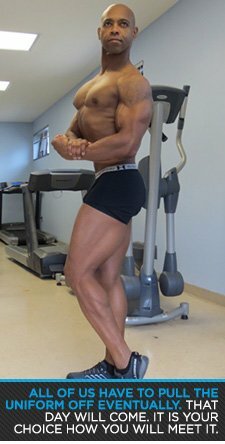 I've been on BodySpace for over five years now. In that time I've gone from fat and out-of-shape to being an NPC national physique competitor. More proof that patience and persistence must finish their work in order to be mature and complete, not lacking anything (see James 1:2-4). Bodybuilding builds strength. It takes strength to serve in the military, strength to serve and come home, and strength to go back and serve again. May this nation's military be forever strong. Lou Ferrigno. I was young when the classic movie Pumping Iron came out. In this movie Lou's forearms looked like huge rippling bands of steel. I was most impressed. I vividly remember thinking, "Wow, I want forearms like that." Steve Reeves. I read everything I could get my hands on about big Lou. I learned that his early inspiration came from Steve Reeves. Once I looked at Steve Reeves, I understood why. Even to this day few have come anywhere close to Steve Reeves' standard of the perfect male physique. 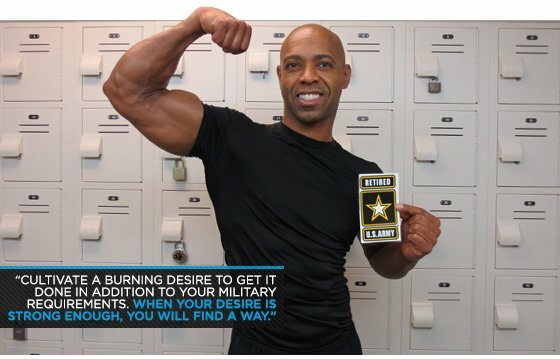 Realize that the qualities that make military success possible are the same qualities it takes for bodybuilding success. It is too easy to consider deployments, eating out of pouches and plastic bags, required morning PT sessions, and the like as what keeps you from reaching your bodybuilding goals. When you want it bad enough, you will stop using the things you must do as excuses that stop you from doing what you can do. Cultivate a burning desire to get it done in addition to your military requirements. When your desire is strong enough, you will find a way.